Eva Cassidy’s story is one of the most compelling and poignant in recent music history. In this thoughtful and probing biography Johan Bakker re-evaluates her brief performing career and the fame that only came after her death at the age of 33. Johan Bakker is a music and arts journalist who writes for Dutch daily newspaper Nederlands Dagblad and CV.Koers magazine. He has also published plays, short stories and song lyrics. He lives in Rotterdam but frequents the UK. Great book of marvellous artist Eva! Johan Bakker is a great writer! Yeah! That's a great book. Finally honored with this book. I love the music from Eva and now got to know the story behind it. a short live for a great woman, good book! It's time to honour Eva as one of the most versatile, authentic amd gifted singers the world has ever seen. This excellent book puts Eva Cassidy back in the spotlight. Great book for a great singer! Great debut for rookie Johan Bakker. A fascinating and insightful read. A must have for any fan of the wonderful Eva Cassidy. 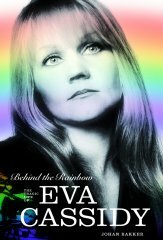 The book every Eva Cassidy fan has been waiting for, and what a great read it is! Written with a raw passion and a pure sensitivity, like Eva's songs. Taken from live, Johan's Eva biog, you read it at a spell. Here in Holland we like the song of Eva Cassidy A marvellous book about Eva,s short live. Great book, about a great singer. Johan's book is fascinating like Eva's voice. Fantastically written - a real insight into Eva's all too short life. A must read. A great read about an artist who died far too young.